The last episode of “The Transmission” will take a little longer than planned to come together. Perhaps we’re having trouble letting go. Perhaps we’re just disorganized. Perhaps Ryan forgot that his mother-in-law would be in town. Either way, we appreciate your patience, and if you haven’t yet chimed in with your series-in-review comments, now’s your chance! Mahalo. For the final episode of “The Transmission,” we want to take a special, wistful look back on the last six years of “LOST.” So much has happened since the moment Oceanic Flight 815 crashed on that mysterious island on September 22, 2004… both on the show, and in the “LOST” fan community. As far as “LOST” is concerned, we’d love to to get your pick for your favorite episode of all time. You could also tell us about your favorite character, or your favorite story twist. There are probably too many great moments to count. But we’re also curious to learn what “LOST” has meant to you. Simply top-notch television? A much needed escape? An excuse to connect with friends, or make new ones? Tell us your “LOST” story. You can comment below, e-mail us at lost@hawaiiup.com, or call the LOSTLine at (815) 310-0808. We hope to release our podcast on June 27. But we may take longer than expected to collect ourselves! Nunu, the beloved dog of Jorge Garcia and Bethany Shady, died last month just as they all were preparing to leave Hawaii. Nunu had her own share of fans, and even appeared in an episode of “LOST” this season. We sent our condolences, and memorialized Nunu at the Memorial Day lantern floating ceremony the next day. But I felt the “LOST” fan community could do more. Taking inspiration from Jo, I’d like to encourage “LOST” fans to pay tribute to Nunu by making a donation in her name to the Hawaiian Humane Society. 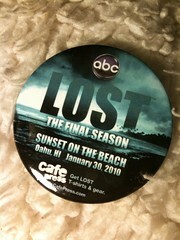 If you donate $10 or more, we’ll send you a limited-edition pin from the “Sunset on the Beach” premiere of “LOST” in January. Most of the people at the “Sunset on the Beach” event didn’t get these, whereas T-shirts were in abundant supply. But thanks to a generous benefactor, we have dozens available for this special cause. You can get a pin for every $10 donated, and you can have your pin sent to a friend as a gift… while supplies last! Support the good work of the Hawaiian Humane Society and leave a great island legacy for Nunu. Donate here, and email us your receipt. Of course, be sure to include your mailing address. Mahalo for your consideration. Each season of “LOST” has a distinct personality. From the story arc to the tone, pacing, and  of course  a new storytelling twist. The sixth and final season of “LOST” brought us the last act of the island story, as well as the confounding “flash sideways.” With the entirety of the show now behind us, we’d like to know: How did you like Season Six? Which episode was your favorite? Which tested your faith? Do you have a favorite character moment, or plot twist, or scene? Let’s look at the journey from “LA X” to “The End” in our traditional season-in-review show! Please comment below, send an e-mail to lost@hawaiiup.com, or call the LOSTLine at (815) 310-0808. We plan to release the podcast on Sunday, June 13, 2010, so we’d love your feedback by Friday, June 11. You are currently browsing the LOST Podcast: The Transmission blog archives for June, 2010.